Green tea isn’t the only anti aging superstar in the tea family. Rumour has it, its posh cousin white tea does a better job at keeping those wrinkles away from your face. It doesn’t get the job as often because it charges a higher price. Putting green tea in your lotions and potions is just cheaper. Just like green tea, white tea is derived from the Camellia Sinesis plant, an evergreen shrub. But, the two are made with different processes. Green tea is made by steaming and drying the leaves of this plant. On the other hand, only young tea leaves or buds are used to make white tea. These young leaves are slightly steamed immediately after harvest and the sun dried. This makes white tea the least processed type of tea. You know what this means? Its antioxidant content is VERY high. Way higher than green and black teas. What does white tea do? White tea is rich in catechins, a group of antioxidants that fights wrinkles and keeps them off your face. A 2009 study confirms this. The researchers tested 21 plants extracts and found that white tea has the highest activity both as an antioxidant and as an inhibitor of key MMP subtypes. You already know what an antioxidant is, so let’s decipher the last part of this hieroglyphic. MMP are a group of enzymes that break down damaged or worn out structural proteins (like collagen and elastin) and help wounds heal faster. But when their levels get too high – something that naturally happens as you get older – trouble starts. Too many MMP have the opposite effect and degrade collagen and elastin, leading to wrinkles and sagging. That’s where white tea comes in. Its job as inhibitor of MMP means it can keep them at a non-dangerous level. 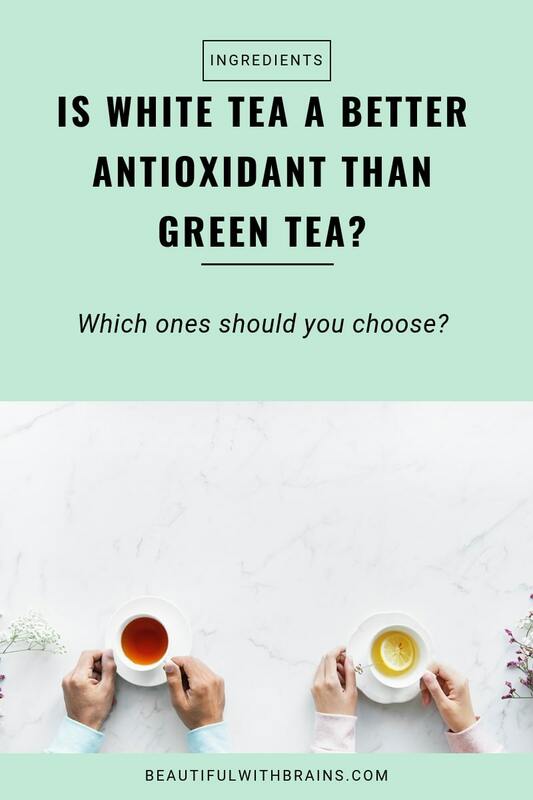 In other words, while white tea is a better antioxidant than green tea, they both protect you from sun damage equally well. But, neither is a substitute for sunscreen! What Are The Best Skincare Products With Green Tea? Do you use skincare products with white tea? Share your fave picks in the comments below. I’ve looked this up two months ago and you have summarized everything and more! :] Oh wow, I looked up the product I was using (antioxidant serum from sophyto) and it has both green and white tea! That’s quite exciting haha. It’s the stuff I get for $30 for two at Sam’s club lol (just a wholesale-type store where you have to buy everything in a pack for a lot less). I don’t use it on my skin but I drink white tea every morning. I can brew it as strong as I want it and it doesn’t get bitter like green tea or some black teas do.